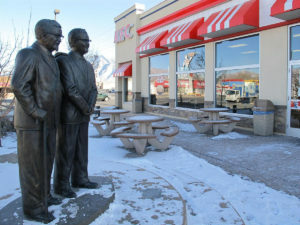 Colonel Sanders and Pete Harman welcome customers to the “World’s First KFC” in Salt Lake City. Photo credit: Lee Benson, Deseret News. Leon Weston “Pete” Harman’s story is perhaps familiar to many people. Harman was the youngest of 14 children in a Latter-day Saint family. 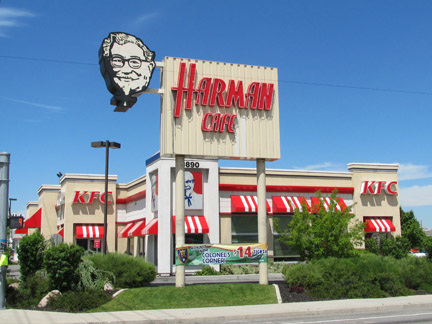 He and Colonel Harland Sanders struck up a deal and opened Harman’s Cafe, which became one of the first known fast food restaurants. Later, the business duo started the first Kentucky Fried Chicken (KFC) franchise. Pete’s claims to fame are the development of the bucket packaging and the emphasis on the “Finger-lickin’ good” motto. The franchise was located in Salt Lake City, Utah, and opened for business in August 1952. However, Pete Harman’s origins actually began with a lesser known person by the name of Caroline Hemenway Harman, or Aunt Carrie, as she was known in the community and by Pete. Caroline was actually Pete’s step-mother, as she was the widow of his uncle. Pete’s mother died two days after he was born, and his father later married Caroline. It was the way Aunt Carrie cooked chicken that helped inspire Pete to begin Harman’s Cafe. 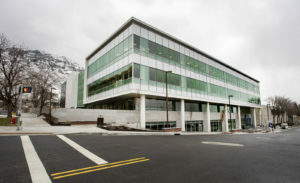 Caroline Hemenway Harman Continuing Education Building. 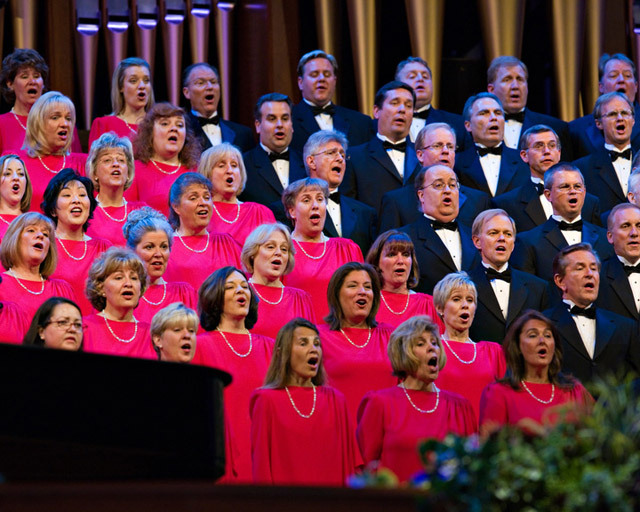 Photo credit: Scott G. Winterton, Deseret News. She saw much adversity in her day, while also serving others without complaint. She was a widow three times over, raised 14 children (including her sister’s children after she died), and suffered from sugar diabetes, all while taking responsibility for a 300-acre farm as well as serving as Relief Society president for 18 years. After most of her children had married, Caroline Harman continued to be productive. She began a chicken farm that soon had 1,000 chickens. As one biographer put it, “Aunt Carrie expected everything around her to be productive, and she would not have a lazy chicken. A hen who lacked commitment was invited for Sunday dinner.